Health figures comparing the different nations of the United Kingdom have been released for the first time. They show that on many measures, such as heart attack survival, Wales is doing as well as England -and significantly better than Scotland. There's also been a marked improvement in stroke survival but the figures also show the challenge faced by the Welsh NHS as more of us live longer. Average life expectancy in Wales for men -78 years- and women -82 years- is only a few months behind the UK average. 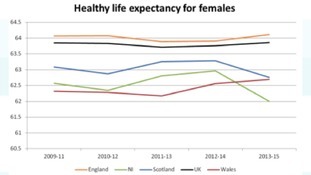 But what the statisticians call healthy life expectancy -the age before health problems develop- is on average 61 years for men and 62 years for women in Wales, both more than a year younger than the UK average. The information published today is helpful to see where we are in terms of other nations, but most importantly it helps us know where we can do better for the people of Wales.